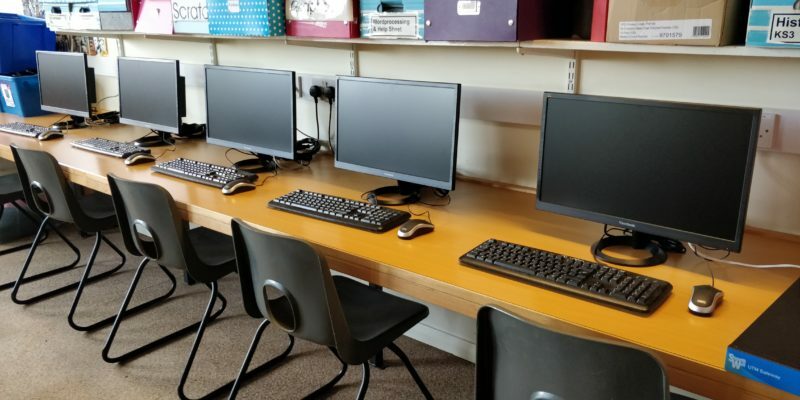 Students all through key stage 3 receive one hour per week in the ICT suite but are able to apply their ICT skills in other lessons using either laptops or the second ICT suite which is available for other subjects. At key stage 4 students who opt to do an ICT qualification, receive 5 hours tuition over two weeks. ICT is seen as an integral part of a student’s learning which is designed to equip them with ICT skills for further and higher education studies as well as the world of work. Students are taught the difference between line vector and bitmap graphics using a variety of different applications including Adobe Photoshop and Illustrator. Students produce edited images and build line vector images. Students use Microsoft Excel, and develop their understanding of different formulae and how to apply formula in different situations. Students are introduced to financial terms within the buying and selling context, profit and loss, income and expenditure. Students develop their spreadsheet skills to incorporate the importance of presentation and extracting particular data into graphs. Students are given a paper based business system to design a spreadsheet solution for a work place scenario. This enables the students to apply all their knowledge and understanding of spreadsheets. Students are expected to apply the functions: IF function and the absolute cell reference. Students continue to use their spreadsheet skills, combined with research skills to cost a city break for 12 adults to Prague or Budapest. Students create the programme of events for each day with information for the tour guide. Year 11: Programming skills 20 hours practical in conjunction with Unit 2 Computational thinking, algorithms and programming. Timescale: Sept to January. Learners will experiment with interactive media products and understand the elements of the development process using hardware and software solutions. 30 Guided Learning Hours, Internally and externally assessed. Learners will understand how to use appropriate software and hardware for the development and creation of an interactive media product and its assets. Learners will present and promote an interactive media product in the creative media industry. 15 hour controlled assessment. The learner will follow a set design brief composed of 3 tasks. KS3: Skills and knowledge are marked to ensure progress is taking place throughout the term. Each student presents their evidence in a portfolio of work. Where accumulative projects are set this is marked on completion of the project. KS3: A variety of tasks are set for homework using different communication techniques, which include email and the Cloud. Opportunities are provided to stretch and challenge students. An underlying theme throughout KS3 is touch typing, enabling students with hand writing difficulties to be efficient with the input of text preparing for GCSE exams if they have access to a laptop. Coding club at a lunch time and an after school session starts after October half term.